Fluoppi (Fluorescent based technology detecting Protein-Protein Interaction) is a novel technology to detect Protein-Protein Interaction (PPI) in living cells with a high signal to noise ratio. The result is a bright, clearly analyzable image. Fluoppi detects PPI as the absence or presence of fluorescent foci during inhibition or induction, respectively. The Fluoppi advantage is the ease of the construction of the PPI detection system with no need for optimizing the linker. Fluoppi is a tag technology. Tetramer fluorescent protein (FP-tag) and Assembly helper tag (Ash-tag) are genetically fused to Protein X and Y, respectively. 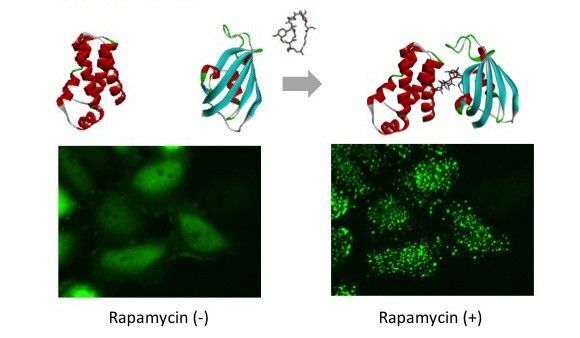 For the FP-tag, tetrameric fluorescent protein (e.g Azami Green (hAG)) can be used. In our in vitro Fluorescence correlation spectroscopy analysis, Ash-tag behaved as tetramer to octomer in diluted solution. Before protein X and Y interact, most of the molecule are disseminated. When protein X and Y interact, these proteins associate each other to form detectable foci. Fluoppi tags are able to work in both N and C terminal fusion. Plasmid vectors of Fluoppi consist of CMV promoter, Fluoppi tags, flexible peptide linker, Multiple Cloning Site (MCS) and Neomycin resistant gene. First, proteins X & Y of interest are fused to FP-tag and Ash-tag respectively. 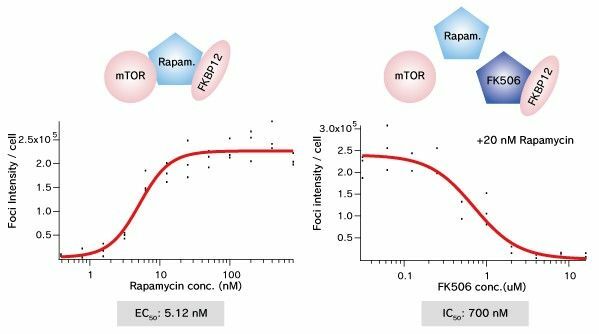 Expression level of tagged protein and foci formation efficiency depend on tag and tag location Formation of foci is reversible so that they can be dissociated and the fluorescent signal will spread over the cell by PPI inhibitors, and vice versa by PPI inducers. Because fluorescent signal of Fluoppi is very high, conventional fluorescence microscopy can be used to image the cell. If the proteins interact with each other upon expression, fluorescent foci will be detected. Formation of foci is reversible so that they can be dissociated and the fluorescent signal will spread over the cell by PPI inhibitors, and vice versa by PPI inducer. Because location of foci is not restricted to a specific site inside the cell, Fluoppi can detect PPIs at several subcellular localizations such as cytosol, nucleus, and juxtamembrane. 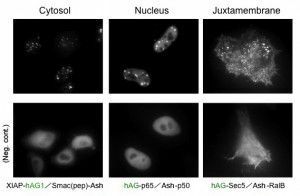 The upper pictures represent foci at several subcellularlocalizations, and the lower pictures are negative controls which express hAG tagged protein and Ash-tag without fusing any proteins. The images of juxtamembrane are taken by Total Internal Reflection Fluorescence Microscopy (TIRFM).  mTOR (FRB domain) and FKBP12 is a well known PPI whose interaction is induced by Rapamycin. 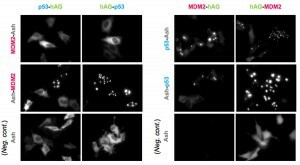 The pair of, mTOR(FRB)-hAG and Ash-FKBP12 was selected from eight possible combinations in a viewpoint of foci formation efficiency. After adding Rapamycin small foci were gradually formed in several minutes. Dose dependent foci formations of Rapamycin (left) or competitive inhibition of Rapamycin by FK506 (right) were analyzed. Cells were treated with Rapamycin for 60 min in 37°C CO2 incubator followed by PFA fixation. Images were captured by ORCA-ER(Hamamatsu photonics) on IX71 fluorescence microscopy (Olympus). The spot detector plugin from ICY platform (Institut Pasteur) and IGOR software (HULINKS Inc.) were used for this analysis. p53-MDM2 is a famous target of PPI inhibitors in the field of anti cancer drug development. We applied this PPI to Fluoppi for demonstration. First, hAG-MDM2 and Ash-p53 was selected from the 8 pairs as represented above, then stable CHO-K1 cell line was established by using two selection marker; G418 and Hygromycin. Fluoppi plasmids including Hygromycin resistance gene is under released at present. 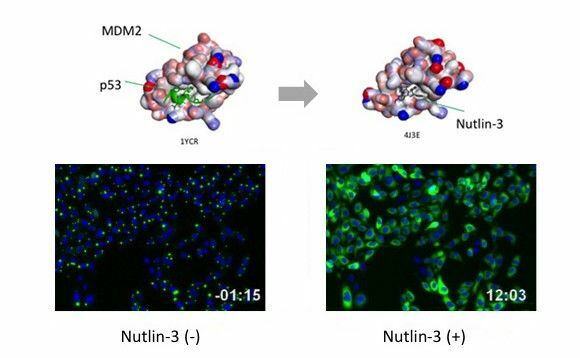 Dose dependent foci dissociations of Nutlin-3 were analyzed. Cells were treated with Nutlin-3 for 30 min followed by PFA fixation. Images were measured by InCellAnalyzer1000(GE healthcare). 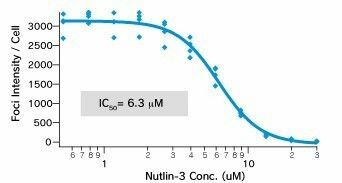 Time course of foci dissociation after adding Nutlin-3 was analyzed. 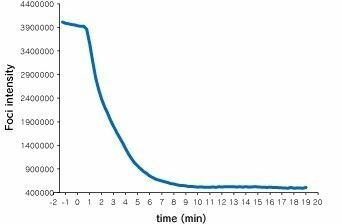 Y axis represents fluorescent intensity of foci.